The Secretary-General appoints the Deputy Secretary-General following consultations with Member States and in accordance with Article 101 of the Charter of the United Nations. The term of office of the Deputy Secretary-General must not exceed that of the Secretary-General. The Deputy Secretary-General of the United Nations is the deputy to the Secretary-General of the United Nations. The office was created to handle many of the administrative responsibilities of the Secretary-General, help manage Secretariat operations, and ensure coherence of activities and programmes. The post was formally established by the General Assembly at the end of 1997. 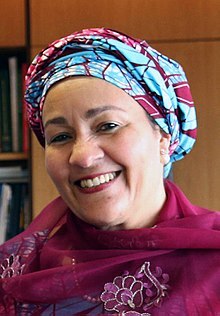 Amina J. Mohammed of Nigeria was named Deputy Secretary-General by then Secretary-General-designate António Guterres. Mohammed assumed the office the same day as Guterres began his term, on 1 January 2017. The Director in the Office of the Deputy Secretary-General is a sitting observer of the United Nations Development Group. Canadian Louise Fréchette was the first Deputy Secretary-General of the United Nations, holding the position from 1998 to 2005. She was appointed to the post by Secretary-General Kofi Annan and assumed her duties on 2 March 1998. In 2005, partly in response to criticism by former U.S. Federal Reserve Chairman Paul Volcker for failed management of the Iraq Oil-for-Food Programme, Frechette announced her resignation. She remained at her post until 31 March 2006. On 3 March 2006 it was announced that Mark Malloch Brown from the United Kingdom would succeed Louise Fréchette as Deputy Secretary-General on 1 April 2006. Brown left his post concurrent with Kofi Annan's departure as Secretary-General on 31 December 2006. Countries that have had a national serve as Deputy Secretary-General of the United Nations. ^ a b c d United Nations. General Assembly (52nd Session) (1998-01-09). "Renewing the United Nations: a programme for reform (A/RES/52/12 B)" (PDF). Retrieved 2007-01-08. ^ United Nations. General Assembly (52nd Session) (1997-10-07). "Report of the Secretary-General, Addendum (A/51/950/Add.1)" (PDF). Retrieved 2010-11-20. ^ United Nations. General Assembly (52nd Session) (1997-11-10). "Letter dated 10 November 1997 from the Secretary-General to the President of the General Assembly (A/52/585)" (PDF). Retrieved 2010-11-20. ^ a b c United Nations Dept. of Public Information. "Deputy Secretary-General". Archived from the original on 2007-01-11. Retrieved 2007-01-08. ^ "Respecting gender parity and geographical diversity pledges, SG-designate Guterres appoints core team members". UN News Centre. United Nations. 15 December 2016. Retrieved 15 December 2016. This page was last edited on 21 November 2018, at 08:11 (UTC).